Corrosion-resistant, black powder coated ball mount measures 5-9/16" from center of hitch pin hole to center of ball hole. Use it in either the drop or the rise position to fit your application. Hitch pin and clip sold separately. 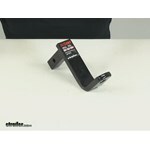 Call 800-298-8924 to order Curt drop hitch part number C45028 or order online at etrailer.com. Free expert support on all Curt products. 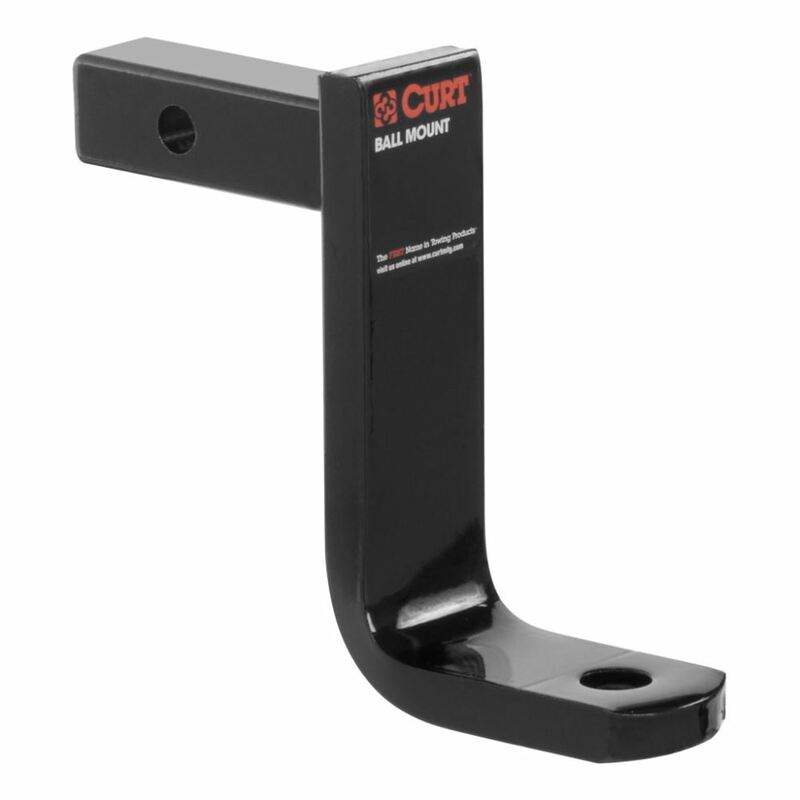 Guaranteed Lowest Price and Fastest Shipping for Curt Drawbar for 1-1/4" Hitches - 5-3/8" Rise, 6" Drop - 5-9/16" Long - 2K. 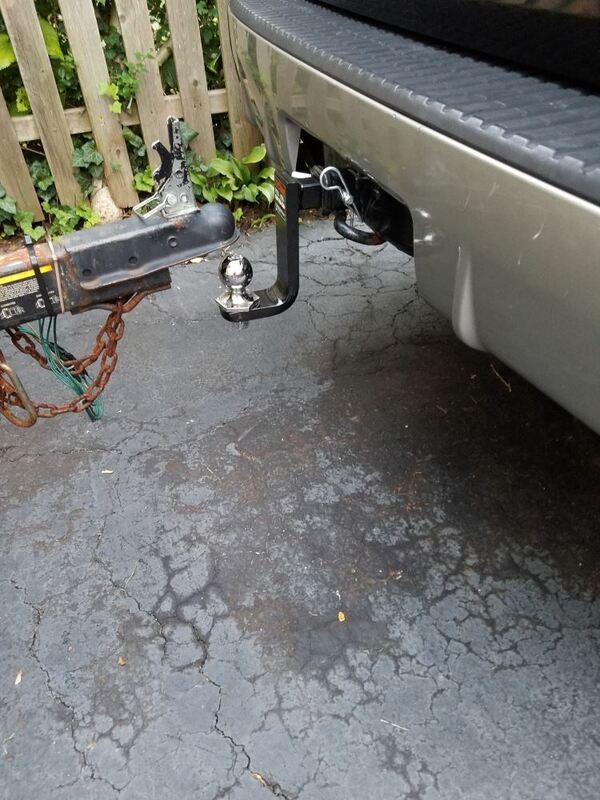 Drop Hitch reviews from real customers. Corrosion-resistant, black powder coated ball mount measures 5-9/16" from center of hitch pin hole to center of ball hole. Use it in either the drop or the rise position to fit your application. Hitch pin and clip sold separately. Sturdy steel ball mount measures 11-1/2" from pin hole to ball hole. Use this Class III accessory in either the drop or rise position to fit your application. Sturdy steel ball mount with a solid shank measures 7-1/4" from center of hitch pin hole to center of ball hole. Drawbar is Class II compatible only. Powder coat finish is corrosion resistant. 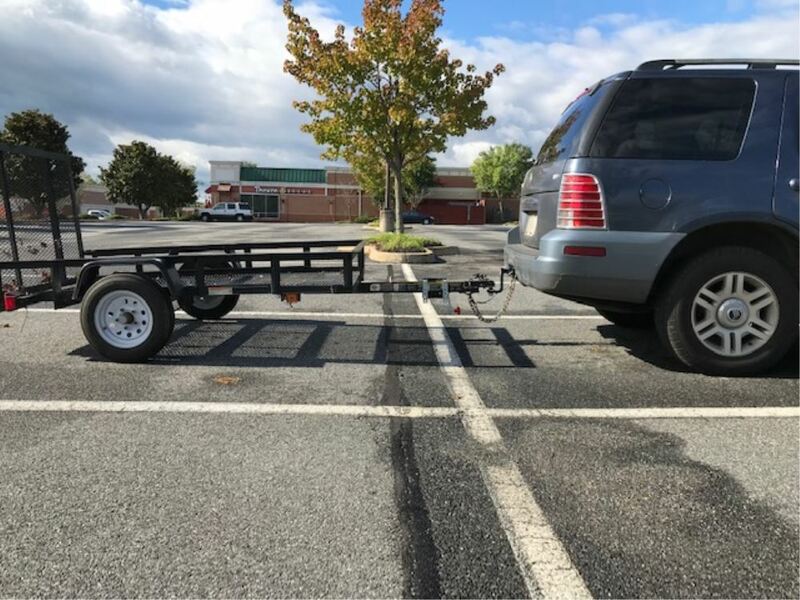 This tall ball mount lets you easily tow a trailer with a lifted truck. It measures 12-1/2" from center of hitch pin hole to center of ball hole. Cushioned interior absorbs shock. Powder coat finish resists corrosion. 2,000-lb Max tongue weight. 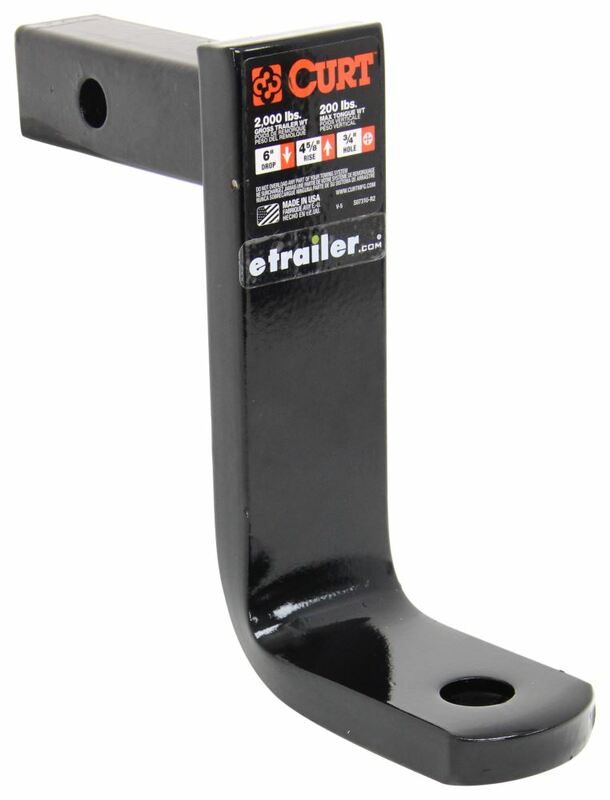 Hitch Extender For 1-1/4" Trailer Hitch Receiver 10"
Today we're going to be taking a look at part number C45028. 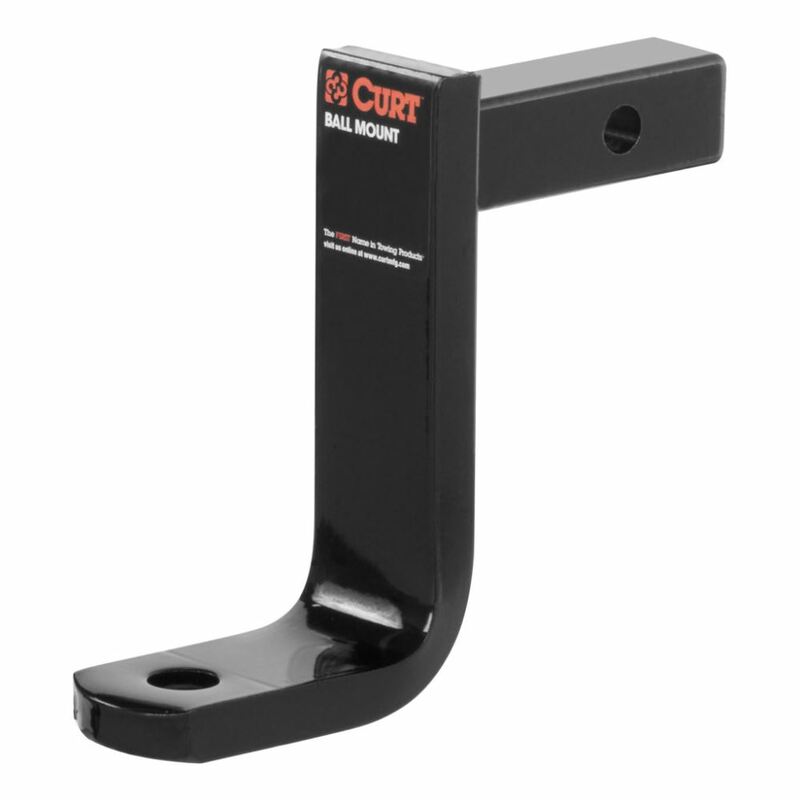 This is the Curt Drawbar for 1 1/4" Hitches. This ball mount is going to let you hook up your trailer to your tow vehicle. It's going to have the shank right here, it's a nice solid shank. This is going to slide into the receiver tube of your hitch on your vehicle. Then your ball platform is going to provide a good mounting point for your hitch ball. Hitch balls are going to be sold separately. You can use this in either the drop or rise position, so both are available to help ensure a more level tow. It's made from a sturdy steel construction. It's going to have a corrosion-resistant, high-gloss black powder coat finish. Now to secure this inside of your hitch, you are going to need a hitch pin and clip or a hitch pin and lock. The diameter of this hole's going to measure a 1/2". Those are going to be sold separately, you can refer to our website. We offer a lot of different options when it comes to a pin and clip or a pin and lock for 1/2" diameter pin holes. Curt's going to make this in the USA. Again, it is designed for 1 1/4" x 1 1/4" trailer hitch receivers. This is class 1 and class 2 compatible. It's going to offer a gross towing weight of 2,000 pounds. With a maximum tongue weight capacity of 200 pounds. A few measurements to go over with you real quick. If we take a measurement from the center of the hitch pin hole to the center of the hitch ball hole, that measurement is going to measure right at 5 9/16". Now, again, this can be installed in either the drop or the rise position. This would be your drop position, if we measure from the top of the shank to the top of the ball platform, it's going to give us a drop of 6". Then if we take a measurement of the rise, measuring from the top of the shank to the top of the ball platform, that's going to give us a rise of 5 3/8". Now, the ball hole diameter on this particular mount is going to measure 3/4 of an inch. Keep that measurement in mind when choosing the hitch ball, you want to make sure the shank of the hitch ball matches the ball hole diameter of the mount that you want to install it on. Curt's also going to cover this with a limited lifetime warranty. Again, you're going to have the solid shank, 1/2" diameter pin hole and the drop 6", rise is at 5 3/8. That's going to do it for our review of part number C45028. 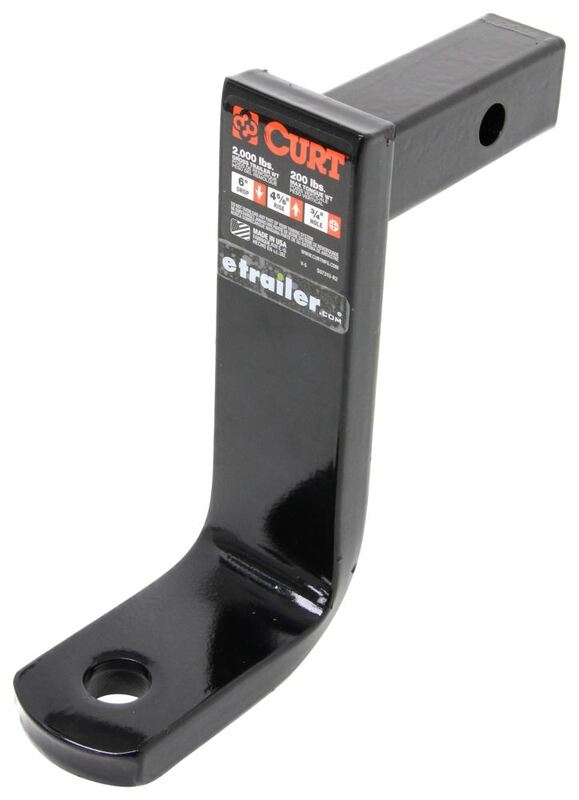 This is the Curt Drawbar for 1 1/4" x 1 1/4" Trailer Hitch Receivers. .
Order: RelevanceNewestRating - High to LowRating - Low to High Corrosion-resistant, black powder coated ball mount measures 5-9/16" from center of hitch pin hole to center of ball hole. Use it in either the drop or the rise position to fit your application. Hitch pin and clip sold separately. Do you have a question about this Drop Hitch? When measuring for ball mount rise/drop needed you have to measure from the bottom lip of the coupler to the ground and not from the top like you mentioned. That means your trailer height is going to be more like 20 inches instead of 22 inches. That being said the closest ball mount we offer to what you need is going to be the part # C45028 which can do a rise of 5-3/8 inches. Then for a 2 inch ball you would want the part # C40018. 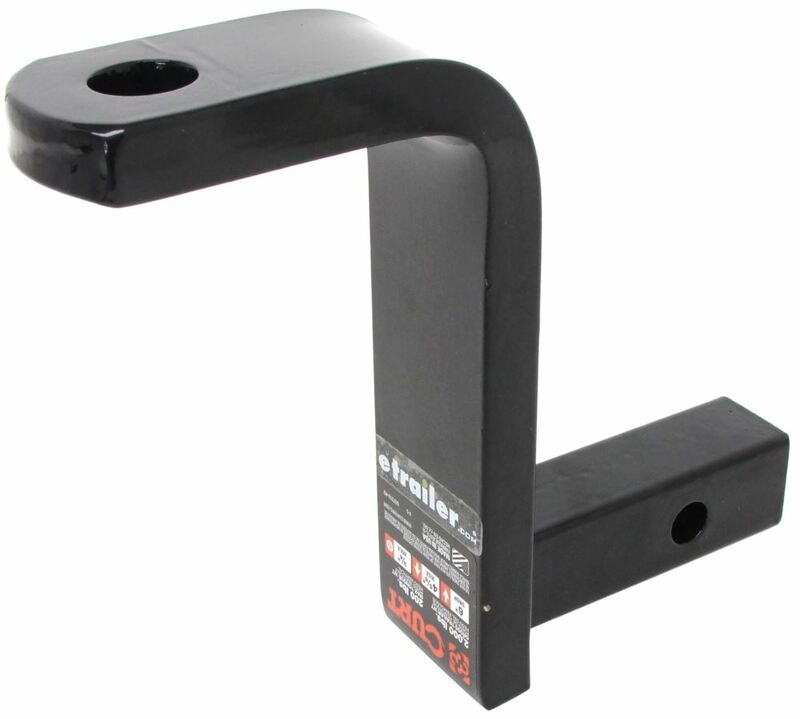 None of our manufacturers offer an adjustable ball mount for a 1-1/4 inch hitch receiver. The Curt # C45028 ball mount has the largest rise/drop of any of the Class I, 2000 lb capacity ball mounts we offer, it has a 5-3/8 inch rise or a 6 inch drop. 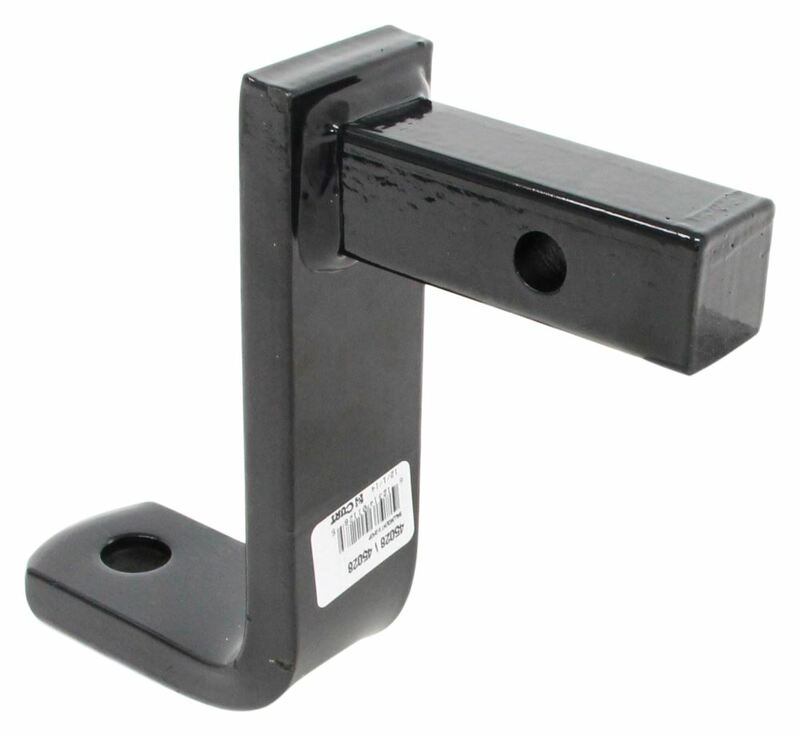 For a Class II ball mount with a 3500 lb capacity, with the same rise/drop, use part # BM96. The biggest rise we offer in a 1-1/4 inch ball mount is 5-3/8 inches, and that is part # C45028. 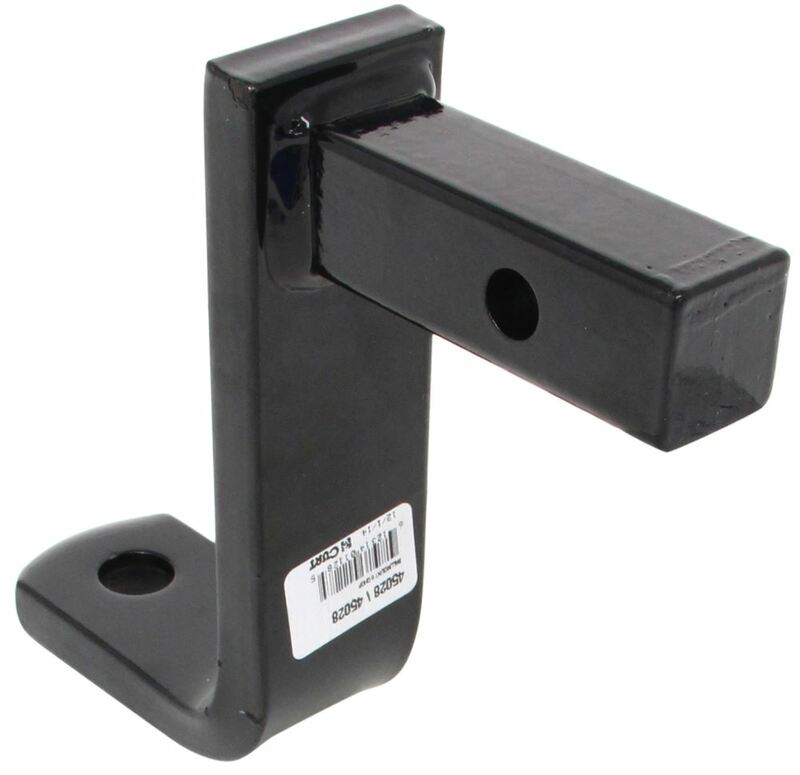 This ball mount is a Class l and also features a 5-9/16 inch drop. 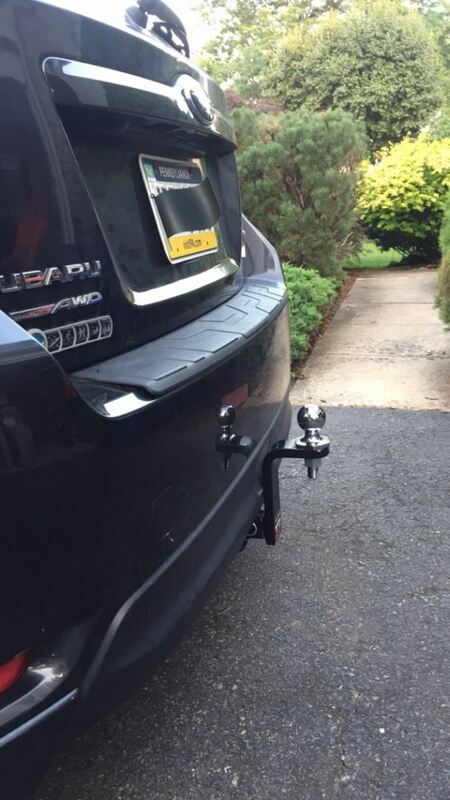 This ball mount is rated for a gross towing capacity of 2,000-lbs. The hitch pin and clip I recommend is part # F-4. For a 1-7/8 inch hitch ball I recommend part # C40001 and for a 2-inch ball I recommend part # C40018. 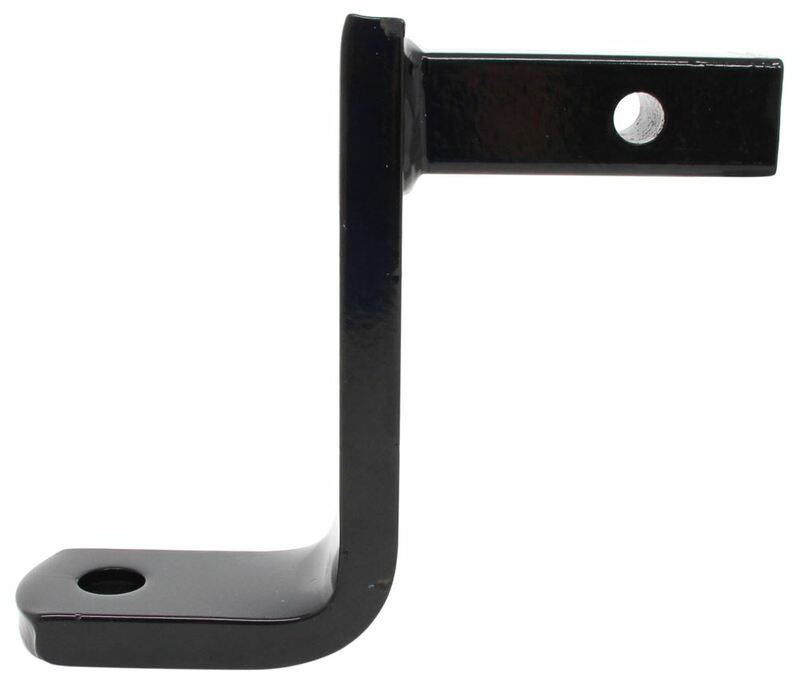 Highest quality drop hitch for the best price. Most detailed, accurate drop hitch information available.